Chelsea manager Maurizio Sarri has admitted that his job is always at risk following the club's embarrassing 6-0 defeat at the hands of Manchester City on Sunday. The west London side had come into the game searching for their first away win of the year but they were simply stunned after going down 4-0 within the opening 30 minutes. Thereafter, the Blues tried their utmost to find the scoresheet but they were eventually on the wrong side of a heavy embarrassment with the Citizens thumping them by a further two goals in the end. 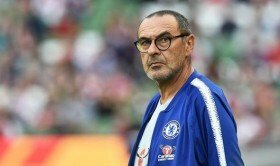 Speaking after the match, Sarri acknowledged that his job with the club always remains at risk but he would rather focus on the league proceedings after the latest setback on the road. “I don’t know, you have to ask the club. I am worried about my team, I am worried about the performance but my job is always at risk so I am not worried about the club. You have to ask the club," he told Sky Sports. With the defeat, Chelsea have failed to score in the past three away matches where they have conceded a staggering 12 goals. They have now dropped to sixth in the standings behind Arsenal on the number of goals scored.